Twistgrid is a web-based solution offering overview and analysis of a broad range of datasets. It is an advanced datagrid supplied with data and configuration from an enclosing program. One example of such an enclosing program is the upload functionality and menu shown on twistgrid.com. Whether it be publicly available datasets or your own, twistgrid enables anyone to immerse themselves in large datasets by filtering, grouping, sorting and pivoting interactively – with subsecond delays and complete drill-down. The response is equally fast independent of the number of simultaneous users. Get more insight at a glance with calculations such as weighted averages or standard deviation. Analyze, learn, and share links to specific views. 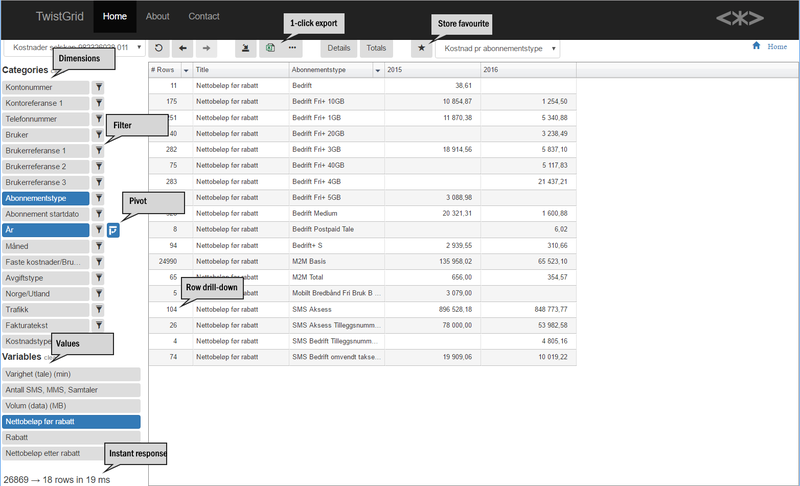 Complete drill-down is always available, as well as single-click export to Excel for further analysis. The truly interactive subsecond response of Twistgrid encourages exploration and facilitates real understanding of the data. Easily identify trends, outliers and errors. No longer are you limited to a fixed set of reports, or discouraged from exploring by old-fashioned click-and-wait. Built-in graphing tools aids the user in gaining insight from large datasets. The data formats supported by the grid are zipped json and a compressed text format based on json. In the second alternative, straight-forward manipulation of the contents substantially increases the compression factor. For relatively static datasets the compression factor in both alternatives is further increased by using zopfli instead of zip. Server-side source code for converting json to the custom json-like text-format is supplied free of charge in any code language. The most prominent reference customers for Twistgrid are Add Energy Novatech and EPIM. Add Energy Novatech is a major supplier of environmental impact accounting and tracking systems worldwide. Twistgrid is used in their product NEMS Accounter as a replacement for summary reports, thereby enabling further analysis and drill-down. EPIM represents the entire set of oil industry operators in Norway, enabling cooperation on non-business-critical areas such as government reporting. Twistgrid is used in their product EPIM Environment Hub facilitating advanced data analysis on the submitted data to the Norwegian Environment Agency (Miljødirektoratet) and Norwegian Radiation Protection Authority (Statens Strålevern).